I've noticed that the Big Nate books are very popular with the elementary students, and had heard some not-great things about them, so I took a look at a couple to draw my own conclusions. 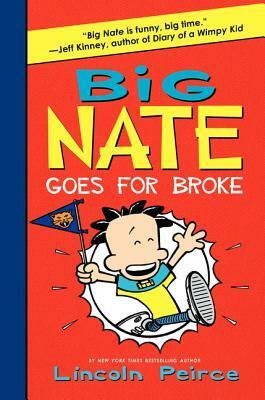 I read the first book, Big Nate: In a Class By Himself, and Big Nate Goes for Broke. First, the info. Titles are above. Publisher: Harper Collins, 2010 and 2012. 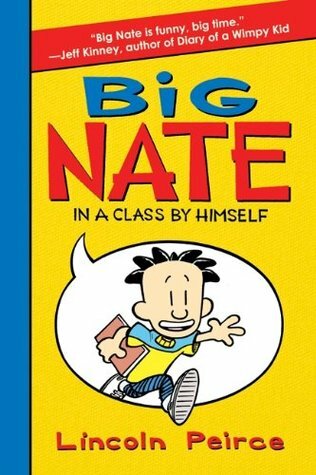 Big Nate is a middle-schooler, 6th grade (that's about age 12, for my British readers). He's no star of his school--in fact, his stories seem to be more about his disasters, though he always grasps victory--of a sort--from the jaws of defeat, which isn't a bad message. I would even say that his victory in "Goes for Broke" is a good one. I'm less impressed with his triumph in the other book, which is to accumulate more detention slips in a single day than any other kid--though he does seem more hapless than ill-behaved. The bad message is how often his jokes and triumphs are at the expense of other people. When he wants to tell us about his wonderful Cartooning Club in "Goes for Broke," he does it by telling us why all the other clubs in the school are lame (in the process making fun, as usual, of those who enjoy and excel at academics). Yes, I can see why kids would laugh at those jokes, and yes, it's how humor often works at that age, but I'm no fan of jokes that rely on belittling others and see no need for books to model what the kids will all too often do on their own. In "In a Class By Himself," a lot of the negative humor is directed at the teachers. They are all old, fat, evil, etc. Again, maybe that's how an under-achieving middle-schooler views the teachers, but I'm not impressed. What's wrong with having some decent teachers? For that matter, would it be so bad if Nate were engaged in even one of his classes? Finally, Nate himself is often the victim of bullies who go unpunished and whom the teachers never seem to see through. Let's give teachers some credit here, Mr. Peirce! (And MUST every extra-large middle-school boy be a bully? That's not been my experience). Certainly neither students nor teachers at PS 38 or their rival Jefferson Middle School seem to have any familiarity with things like Restorative Justice. I realize that it wouldn't fit the tone of the books to have that degree of realism. And maybe that's just the problem. As you have no doubt gathered, I'm pretty unimpressed with these books. I don't really recommend them for anyone, despite their obvious appeal to a certain demographic. I might even go so far as to say these would be an exception to my usual rule that any book a kid wants to read is a good book. I don't know. Maybe the kids see through Nate and recognize that his mockery of others is just his insecurity talking. But I suspect that most are just embracing a confirmation of their own urges to build their own sense of self by running down everyone else. There's enough mean-spirited behavior among kids that age to lend a ring of truth to the books--but there's also enough that the kids don't need any extra. FTC Disclosure: I checked the Big Nate books out of my library, and received nothing from the writer or publisher in exchange for my honest review. The opinions expressed are my own and those of no one else. I am disclosing this in accordance with the Federal Trade Commission's 16 CFR, Part 255: "Guides Concerning the Use of Endorsements and Testimonials in Advertising." Yeah, I was kind of disappointed. I'd hoped at least for something more like Captain Underpants, which is silly and full of potty humor, but not mean-spirited. BIG NATE appears as a comic strip in more than 200 newspapers in America. I had heard it was a comic strip. I haven't seen the strip to know if it shares that kind of snarky humor at others' expense. I think there are some comic strip collections at our library as well, so maybe I'll take a look. I did borrow a book of the comic strips from my library, and they seem to me to be funnier and less mean. Much more of the hapless kid that Jemima was hoping for!